anyone who frequents the blog will notice that my entries have been far and few between. not that i have a dearth of topics to write about, but i have perpetually been deprived of time. while writing appears to be natural for me, i really have to find time to do it. i can draw inspiration from anything, and can write about the most mundane as well as the most profound subjects, given the opportunity. so it is true after all: despite all indications, i also have days when i'm flooded with work. the last weekend marked the beginning of the end of the 2009 BMC. 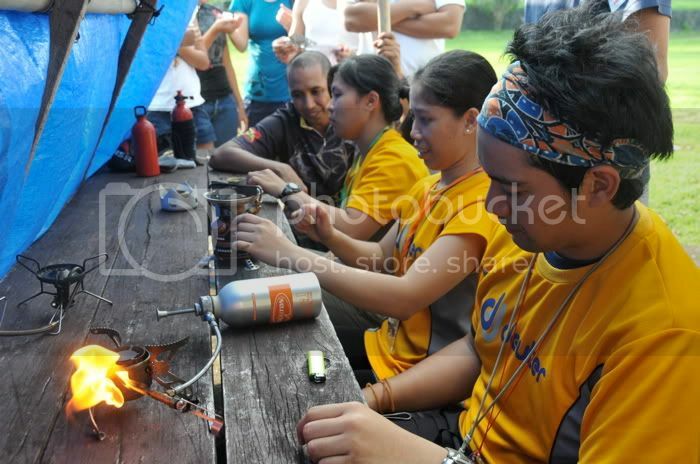 it was decided to compress the orienteering activity as well as the 15-K qualifying run, to save both time and costs. which is an improvement, i would say, from the first calendar, which had placed the 15-K too close to the induction climb. the orienteering weekend is always fun, if not for the trainees who are terrorized by the idea of having to take an exam, read maps and navigate with compasses, and employ skills learned over a period of 3 months while dressed for battle, but for the members, who lug along meals worthy of a modest feast, along with crates of alcohol in a bid to be the last to pass out. 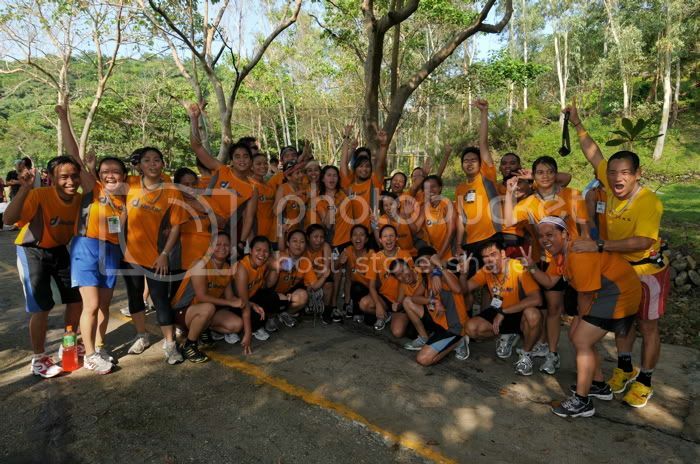 i was also somewhat involved in a different activity: as support group for TMM-timex participating in the first corregidor aquathlon. 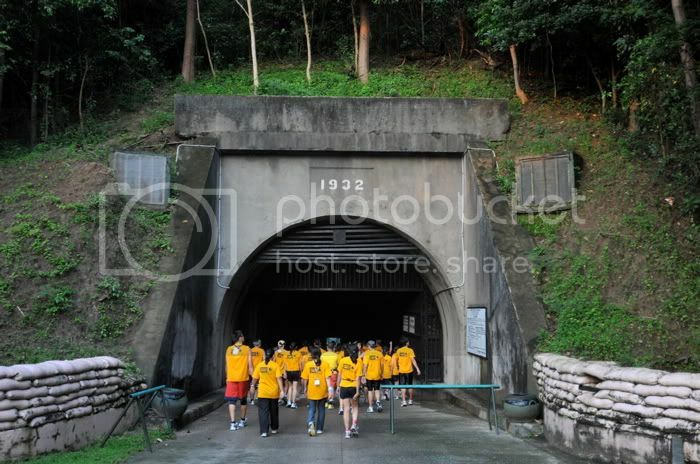 i was personally very excited about the weekend because it would be held at the island of corregidor. not only will i be able to update my lakbayan map, but also i hoped to see a bit of the historic place. i did what seemed to be humanly impossible: i brought along my entire kitchen, all my mountaineering gear, plus my bike. also, i volunteered to do most of the groceries and the meal planning. in hindsight, not being able to collect from everyone, i now realize that this is both stupid and tiresome. i will think twice about doing it again. anyway, at a shave before 5am on saturday, i was already at CCP. i hadn't slept the entire day friday: went to quiapo, did the groceries with janice, dropped off my bike at roy's, picked up the pinaupong manok from home, and drank till 2am at joven's place. and i hadn't packed. nonetheless, i was awake for most of the trip to the island, even while the tour guide gave us a history lesson. my eyes were closed and i feigned sleep throughout, but i listened and absorbed. at corregidor, we were dropped off at our station. i was invited to share my rice cooking skills at the meal planning station. but before we could focus our attention on the orienteering activity, there was the aquathlon. i had seen many of them inside the ferry and they looked pretty scary. by that i mean i wouldn't want to take my shirt off in their presence, nor would i want to be in competition against any of them. and that's just the girls. 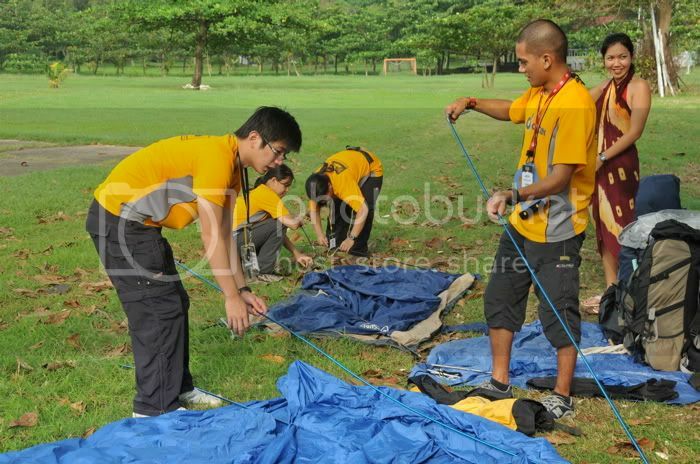 due to a lack of personnel, i somehow ended up helping out the organizers, and even doing the body markings. i should volunteer to do this more often! and then i handed my camera to dindo and decided to take videos of the aquathlon instead. 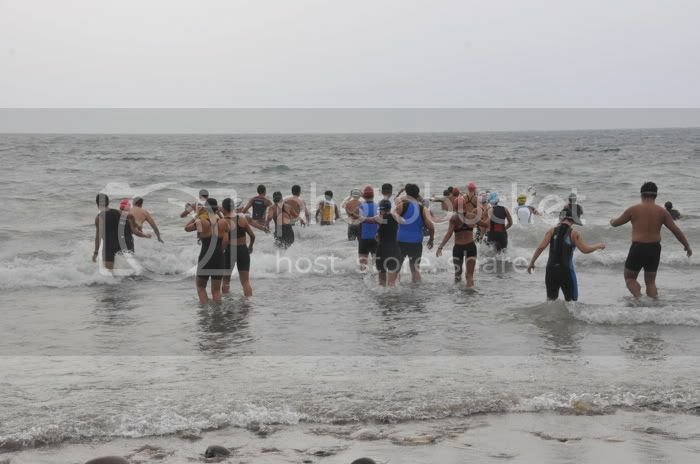 the waves were huge, and it was difficult to swim in chest-deep waters, so for the first 400-meter swim, most of the participants were just wading. it was quite funny to watch. the run leg is 7km, and it goes up to the ruins of countless barracks, along a steep road which was difficult to bike. i would have much preferred running some portions. and to think i was briefly possessed with the idea of joining the race. thank goodness i had second thoughts! by the time i was back at the beach, roy was already halfway through the final swim, and he was the first to cross the finish line at a time of just over 50 minutes. after the aquathlon, i managed to sneak in some sleep. we were the last station so the trainees would only be arriving late in the afternoon. and at around 4pm, they showed up, going through the motions of the activity, station by station. i was rowing in two rivers, actually, because i also had 2 stoves at the stovemanship station, where i also lectured and shared. in so far as skills are concerned, i really don't believe in evaluating what a trainee knows; i'm more eager to share what i've learned, and work on the trainee's knowledge from previous climbs. that's why we're here after all. by the time most of the groups had arrived, night had fallen, and many of them were cooking rice illuminated by headlamps. i was already frequently distracted because i had to deal with our meal plan. when we started eating, some groups were still working on their rice. a few of them had hard heads and stuck to their age-old methods, which have been proven to be ineffectual. i've learned very early in my mountaineering exploits never to settle for good enough. so while they struggled with making something edible out of their experiments, we began the feast. my mom's pinaupong manok was a big winner, and so was my ginger dip. mannie also threw in kobe beef salpicao and cream dory fish fillet with 17 (not-so) secret spices. everything that followed seemed to be a blur. 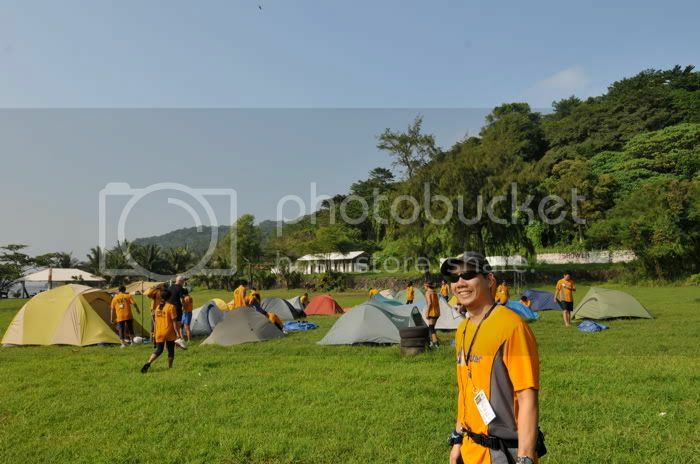 i don't know when the first bottle was uncorked, or how and why i ended up in a dance showdown with al, or why i cried buckets when i visited the trainee campsite, and when i finally ended up inside my tent. but that's about the sequence of events as i remember it. of course, there were many swigs and hoots and screams in between, but they all happened so fast, i didn't have time to absorb much of it. the next thing i knew was rising up in the midst of an uneasy dawn, wanting to be of some use during the 15-K. i mounted my bike, went to where the trainees were doing their warm-ups, and looked to see what i could do. i was asked to lead the prayer and deliver 6 liters of water 6 kilometers away. i biked back and forth, and enjoyed the view immensely: there's something about corregidor that begs another visit. but the current concern was the 15-K. in a way, the terrain was less unforgiving than the steep slopes of los baños, but the distance between water stations was some cause for concern for me. there were also stretches of road where no members were present. 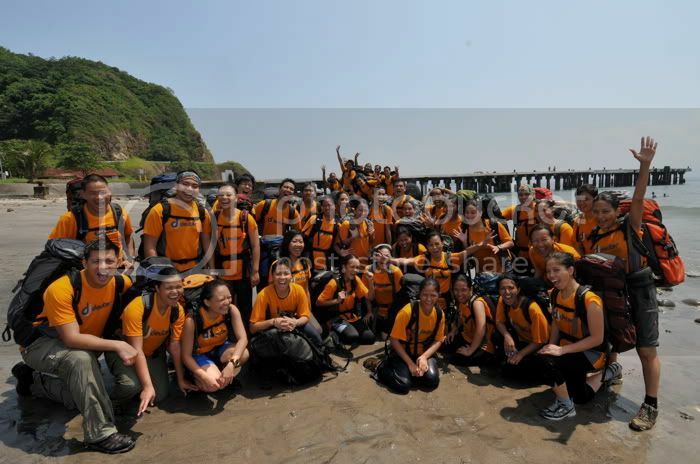 nevertheless, the support could be felt in the whole island: some members ran the entire course alongside trainees who needed a push, a shove, a tug, a pull, and maybe some motivation. on my last bike back to the finish line i decided to pick-up eds along the way, to egg her on and resist the temptation to walk. eds is going to be part of my induction group, and i remember clearly how it was when we did our 15-K. previous to her, i had seen many faces, some gripped by pure exhaustion; others convulsing under the heat. but there were many more smiling despite the difficulty. if everyone had paid attention to the training, finishing 15 kilometers should be possible. not necessarily easy, but doable. eds was determined to finish the run, although many times she was about to give up and surrender. i could see she was about to crack. my job was to provide the external push. i couldn't carry her; i couldn't run on her behalf. but i can give her countless reasons why the demons tempting her to stop or to pause should be ignored. finally, we went inside the darkness that is the malinta tunnel, and i kept reminding eds that only a short distance was left. just a bit more, just a bit more. i was behind her right to the finish, where she finally heaved a sigh, laughed a little, and cried. and then i looked back. there were a few more behind, and i worried they might not finish. and then i heard thundering cheers. emil and donna were both making a mad dash for the finish. i couldn't quite explain why, but as they neared, tears welled in my eyes and i was just overcome with emotion. i was a trainwreck! i had to fight back the swelling joy and pride for a batch that i've seen grow through several wednesdays, a few sundays, and 4 climbs. it was just not right to be crying when the event demanded celebration. but the day wasn't over yet. we had to deal with the backpack rafting activity, then lunch, and then going home. i'd have to admit that they rafted no more than 150 meters. it was the shortest rafting activity i could remember. we floated on a still river for more than 30 minutes, towing others in our group! and because we had a pre-rafting inspection, no one came out of the water with water inside their bags! finally, it was time to go home. we walked to the pier, loaded our bags onto the ferry, and i stayed awake for the 2-hour trip, being evil. haha. i thought i was going to hit the sack early, but i was called to seaside in macapagal for early dinner! and that's what happened to me during the weekend. i still have a backlog of things to write about. maybe tomorrow. or tonight. we'll see. in the meantime, my warmest congratulations to batch 2k9. this early, i'm already looking forward to the mountains i will be climbing with you. "Roy Hervias claims Corregidor Aquathlon top honors!"